Based on the International Building Code (IBC), this updated and expanded edition of the industry standard covers today’s diverse materials, regulations and requirements, specification formats, and more. Just as detailed as the specifications it explains, this comprehensive Second Edition provides all the critical information necessary for completing contract documents, all organized in a quick-reference format. MARYROSE McGOWAN, AIA, teaches interior architecture at the Rhode Island School of Design in Providence, Rhode Island, and is Editor in Chief of Interior Graphic Standards. 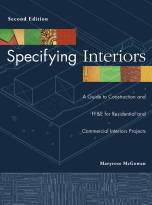 INTRODUCTION TO COMMERCIAL INTERIORS PROJECTS. BASE BUILDING AND TENANT IMPROVEMENTS. The Lease and the Work Letter. Contract Documents for Commercial and Residential Interiors. The Contract for Commercial Construction. The Contract for Furniture, Furnishings, and Equipment (FF&E). LAWS THAT AFFECT THE CONTRACTS FOR INTERIORS PROJECTS. CONTRACT LAW AND COMMERCIAL LAW. Sales Contracts and Services Contracts. Differences Between Contract Law and Commercial Law Warranties. CUSTOM AND STANDARD CONTRACT DOCUMENT FORMS. Chapter 2: Regulations, Codes, and Standards. Other Regulations Affecting Interior Design. Flammability Standards for Construction Materials and Assemblies. FLAMMABILITY STANDARDS FOR FLOOR COVERINGS. FLAMMABILITY STANDARDS FOR WALL FINISHES. FLAMMABILITY STANDARDS FOR WALL AND CEILING OR FLOOR AND CEILING ASSEMBLIES. Wall or Floor and Ceiling Assembly Test. FLAMMABILITY STANDARDS FOR DOOR ASSEMBLIES. Cigarette Ignition Resistance Test for Furniture Composites. The History of Accessible Design and Civil Rights. ADA and FHAA Design Requirements. Chapter 3: Building Systems and Performance. MOISTURE CONSIDERATIONS IN A BUILDING. ACOUSTIC PERFORMANCE OF A BUILDING. Sustainable Product and Material Selection. Chapter 6: Furniture and Furnishings. SHADING FROM SOLAR HEAT GAIN. Appendix A: AIA Document B171 ID. STANDARD FORM OF AGREEMENT BETWEEN OWNER AND ARCHITECT FOR ARCHITECTURAL INTERIOR DESIGN SERVICES. Appendix B: AIA Document A275 ID. GENERAL CONDITIONS OF THE CONTRACT FOR FURNITURE, FURNISHINGS AND EQUIPMENT. Appendix C: AIA Document A175 ID. STANDARD FORM OF AGREEMENT BETWEEN OWNER AND VENDOR FOR FURNITURE, FURNISHINGS AND EQUIPMENT. Appendix D: Uniform Commercial Code, Article 2 (Abridged).